MHCA’s massive red brick building at 801 Chase Street was built in 1932 to house the then all-white Annapolis High School. It has a Beaux-Arts flair with its arched front windows and the bas-relief over its classical entryway. Large banners announcing upcoming shows—Midori, “Louis and Ella! A New Jazzical,” Esperanza Spaulding, and Blue Oyster Cult— hang along the portico. “I taught here. Room 205, down the hall,” says Bowen, who has served as MHCA’s executive director for 20 years. “I love that the community has artists. They live next door to you. And Maryland Hall supports them. It provides them with studios, it helps them sell their work. It is a community anchor for the artists and creates community pride.” It is also part of the Annapolis Arts District. In the 1700s, Annapolis was the “Athens of America,” ahead of Boston and Philadelphia in having a dedicated theatre space and multiple performance venues. 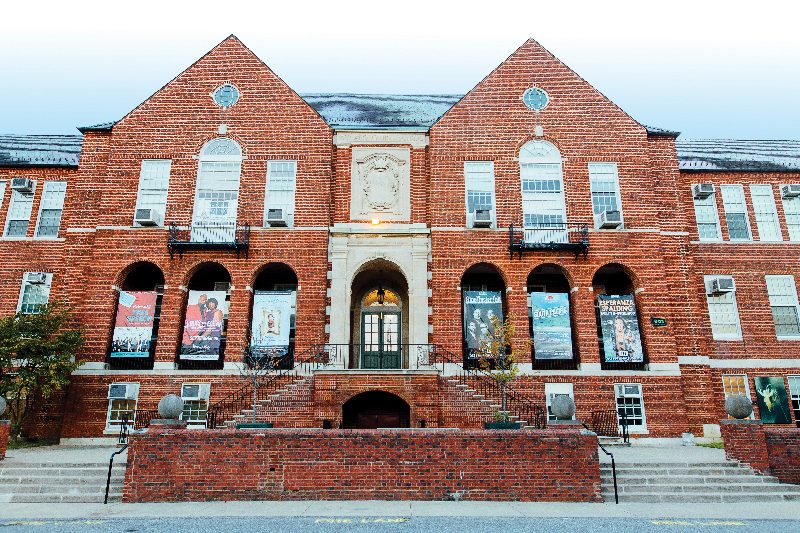 By the early 1970s, groups such as Annapolis Symphony Orchestra, Civic Ballet Company, Annapolis Summer Garden Theatre, Colonial Players, and Youth Experimental Theatre were in full swing. 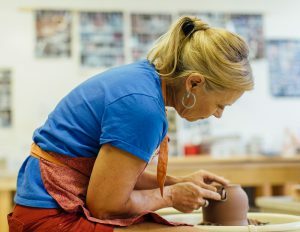 “For a city that had such deep cultural roots, it was amazing that it lacked an arts center,” says community activist and former mayor Ellen Moyer, also an MHCA founder. Efforts to create a center began in the 1960s. Moyer chaired The Committee to Bring a Culture & Education Center to Annapolis, a city effort. Its 1972 prospectus provided a compelling rationale and recommended locating the center downtown on Compromise Street. When the City Council showed little interest in the project, Senator Roy Neville Staten convinced Governor Harry Hughes to convene a commission to develop a plan. Released in 1978, the plan placed the center along College Creek, near St. John’s College, with a five-million-dollar price tag. In 1979, while discussions about location and funding ensued, the county-owned Annapolis High School building became available when the school moved to its current location on Riva Road. Hughes Commission members Joanne Scott and Beth Whaley scoped out and presented a site plan to the Board of Education of Anne Arundel County and the County Council. A lease agreement was negotiated, and MHCA came into being as a 501(c)(3) nonprofit organization. “For our lease, we give tuition waivers to Anne Arundel County Public School students for our classes. We’ve been doing that for over 35 years,” says Bowen, explaining the school board’s terms. “It was visionary.” MHCA took the building, which had many structural problems, fixed it up, and filled it with classes. Today, it offers a rich catalog of courses for all ages and abilities, taught by over 60 artists. Supported by grants and patron donations, MHCA is multidisciplinary, providing a home for all of the arts as well as arts education. 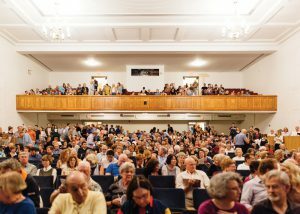 Four resident companies—Annapolis Chorale/Live Arts Maryland, Annapolis Opera, Annapolis Symphony Orchestra, and Ballet Theatre of Maryland—receive rent subsidies for office and performance space and have first dibs on the calendar for the newly renovated, acoustically modernized, 733-seat auditorium. 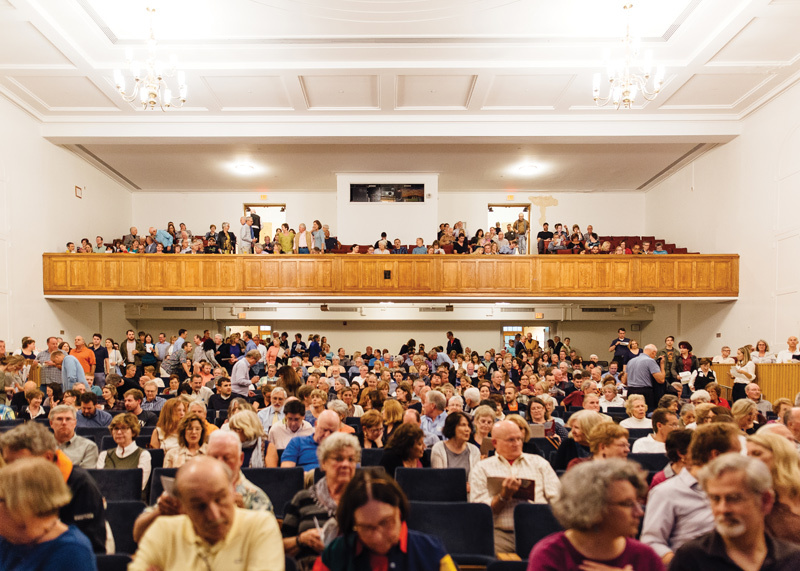 The Chesapeake Youth Symphony Orchestra, Vision Workshops, Peabody Preparatory, and The Writer’s Center—resident community partner organizations—occupy reduced-rent offices and studios. Each resident has its own operating budget and board of directors yet is an integral part of the greater community. 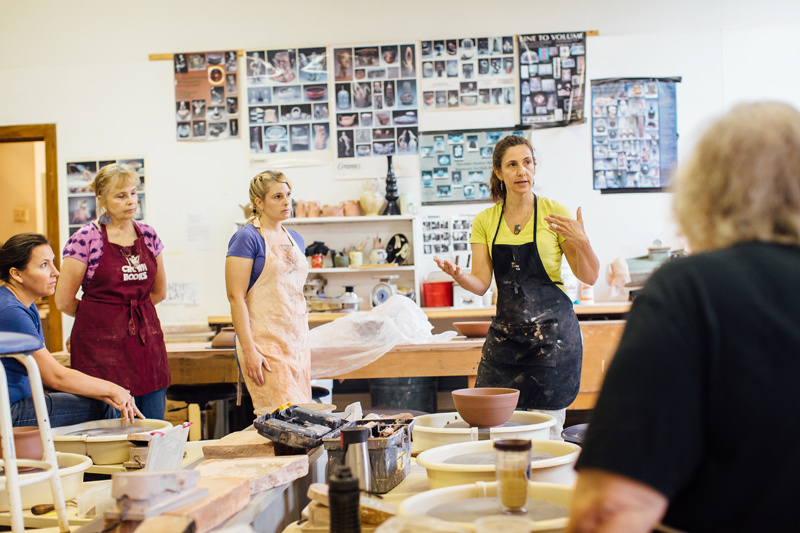 Additionally, over 25 arts and community organizations regularly interact with MHCA. Balancing the more classical repertoire of resident companies, MHCA offers affordable family shows and a free summer music series. “We continue to broaden the audience and reach, making sure we are truly hitting the ‘Art for All’ note,” says Garvin. It partners with World Artists Exchange to bring in international touring groups and Rams Head Group, which presents national contemporary musical acts. Three children’s theatre touring companies present school shows. MHCA has free youth after-school and summer programs for underserved youth. “It’s a way to invite in people who have barriers or challenges that they’re dealing with that maybe they can’t otherwise express. And they feel accepted and celebrated in our arts community,” says Outreach Coordinator Natalie Spehar. Jovenes Artistas, a rigorous three-day-a-week arts and music program for middle and high school age Hispanic youth, involves student exhibitions and performances. 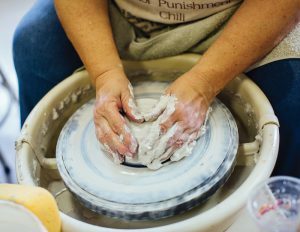 A new collaboration with local attorneys and the Department of Juvenile Services is bringing gifted students on probation to MHCA to work with artists and art and music therapists. Courses and events are also changing to meet current community interests and attract new patrons. 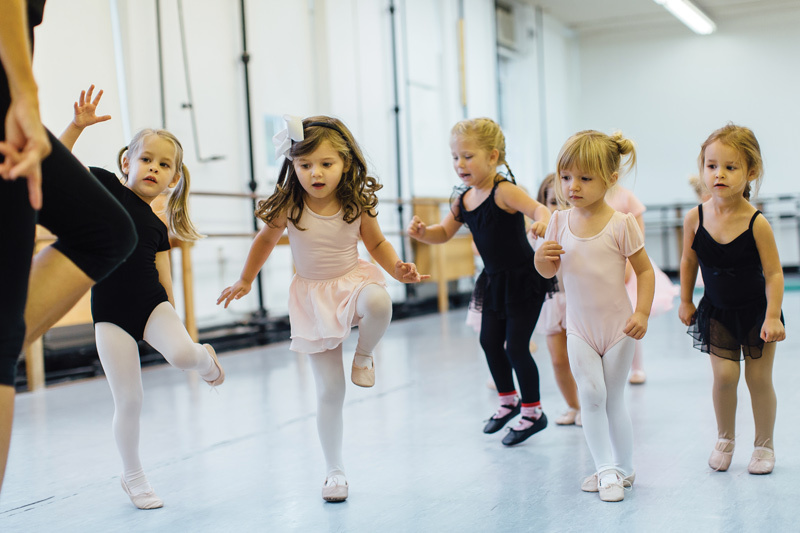 Today’s popular classes differ from those in demand ten years ago, although dance studies continue to be the mainstay. 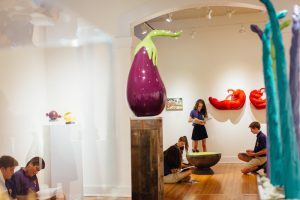 Interactive events such as “Yoga in the Gallery” and “Sip and Color,” and lectures and demonstrations are planned for the future. Also new is Annapolis Young Artists Program, which fosters leadership skills. After taking classical music workshops and master classes, students collaboratively plan and present free concerts for groups that cannot access live performances. “It’s a great way for kids to take the reins of something and bring it to a community.” says Spehar, who founded the program. The building reflects MHCA’s personality and mission. On the first floor, playful murals painted by Brazilian artists fill the walls of the southern wing. Just inside the opposite entrance, an old school-days sign reads, “All Visitors Must Report to the Office.” Upstairs, the performance hall provides a lush sanctuary. It’s grit and refinement, tradition, and innovation. Most importantly, it’s welcoming and accessible. Error: Error validating access token: Session has expired on Saturday, 09-Mar-19 15:57:50 PST. The current time is Tuesday, 23-Apr-19 09:33:40 PDT.